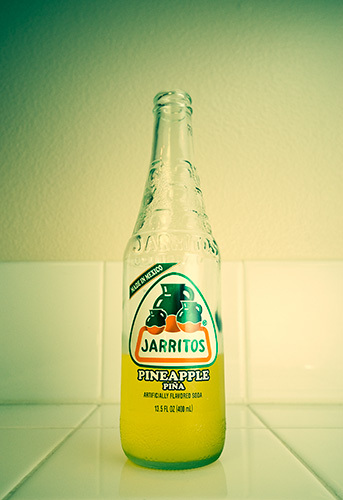 Partially empty glass bottle of Jarritos pineapple soda sitting on a white tile counter. The image was "cross processed" to exaggerate the yellows and greens on the bottle. The partial vignette came from the off camera slave flash — no fake vignette here! This entry was posted in Challenges and tagged art, art and photography, beveridge, bottle, challenge, clear, color, colorful, colour, colourful, drank, drink, empty, february challenge, februarychallenge, februarychallenge2008, Flickr, foto, glass, glass bottle, green, jarritos, mexican, mexico, open, orange, photo, photography, photos, piña, piña refresco, pineapple, pop, project, refresco, soda, soft drink, tile, white, yellow on February 5, 2008 by Brian Auer.